Spencer Bonaventure Tracy (5 Apryle 1900 – 10 Juin 1967) wis an American actor, notit for his naitural style an versatility. Ane o the major starns o Hollywood's Gowden Age, Tracy wan twa Academy Awairds for Best Actor frae nine nominations, sharin the record for nominations in that category wi Laurence Olivier. Tracy first diskivert his talent for actin while attendin Ripon College, an he later received a scholarship for the American Academy of Dramatic Arts. He spent seiven years in the theatre, wirkin in a succession o stock companies an intermittently on Broadway. Tracy's brakthrou came in 1930, whan his lead performance in The Last Mile caucht the attention o Hollywood. Efter a successfu film debut in John Ford's Up the River starnin Tracy an Humphrey Bogart, he wis signed tae a contract wi Fox Film Corporation. His five years wi Fox featurt ane actin tour de force efter anither that war uisually ignored at the box office, an he remeened lairgely unkent tae audiences efter 25 films, awmaist aw o them starnin Tracy as the leadin man. Nane o them war hits awtho The Power and the Glory (1933) featurs argiebly his maist acclaimed performance in retrospect. In 1935, Tracy jynt Metro-Goldwyn-Mayer, at the time Hollywood's maist prestigious studio. 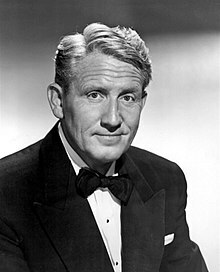 His career flourished wi a series o hit films, an in 1937 an 1938 he wan consecutive Oscars for Captains Courageous an Boys Town. He made three smash hit films supportin Clark Gable, the studio's principal leadin man, firmly fixin the notion o Gable an Tracy as a team in the public imagination. Bi the 1940s, Tracy wis ane o the studio's tap starns. In 1942, he appeared wi Katharine Hepburn in Woman of the Year, beginnin anither popular pairtnership that produced nine movies ower 25 years. Tracy left MGM in 1955, an conteena'd tae wirk regularly as a freelance starn, despite an increasin weariness as he aged. His personal life wis tribbled, wi a lifelang struggle against severe alcoholism an guilt over his son's deifness. Tracy becam estranged frae his wife in the 1930s, but niver divorced, conductin a lang-term relationship wi Katharine Hepburn in preevat. Taewart the end o his life, Tracy wirkit awmaist exclusively for director Stanley Kramer. It wis for Kramer that he made his last film, Guess Who's Coming to Dinner in 1967, completit juist 17 days afore his daith. In his career, Tracy appeared in 75 films an developed a reputation amang his peers as ane o the screen's greatest actors. In 1999 the American Film Institute ranked Tracy as the 9t greatest male starn o Clessic Hollywood Cinema. ↑ "AFI's 100 Years ... 100 Stars". American Film Institute. June 16, 1999. Archived frae the oreeginal on January 13, 2013. Retrieved February 20, 2012. This page wis last eeditit on 6 Apryle 2019, at 20:09.